AMES, Iowa – Northwest Illinois is one of the nation’s most productive corn-growing regions. But the heavy use of fertilizer and manure on corn fields leads to nitrate pollution in many communities’ tap water, according to a new report from the Environmental Working Group. Nitrate can cause serious illness or death to infants, and is linked to increased risk of cancer, according to the National Cancer Institute. In December 2015, the 1,500 residents of Erie, Ill., received a warning that the community’s tap water should not be given to babies under 6 months old, or be used to mix formula or juice for babies. Tests of the water found an average nitrate level of 11 parts per million, or ppm, exceeding the Environmental Protection Agency’s legal limit of 10 ppm. Within weeks the level dropped below the legal limit, but less than a year later, in October 2016, residents were again warned that their water was unsafe for infants. This alarming scenario is a regular occurrence for many small towns throughout the nation’s Corn Belt. Hundreds of communities suffer seasonal spikes in nitrate that push the level above the legal limit. But infants aren’t the only people at risk from the EPA’s outdated nitrate standard, set more than 25 years ago to guard against so-called blue baby syndrome. Recent studies by the National Cancer Institute associate long-term exposure to nitrate in tap water at 5 ppm – just half the EPA’s legal limit – with increased risk of colon, kidney, ovarian and bladder cancers. EWG’s Tap Water Database, based on tests by public water systems nationwide, shows that 10 other communities near Erie averaged nitrate levels at or above 5 ppm in their drinking water from 2014 to 2015. The data also reveal that water supplies for more than 1,600 U.S. communities serving 3.3 million people had average nitrate levels of 5 ppm or higher in 2014 and 2015. Nitrate from fertilizers and manure runs off of farm fields and into the groundwater aquifers that supply many northwest Illinois communities with drinking water. 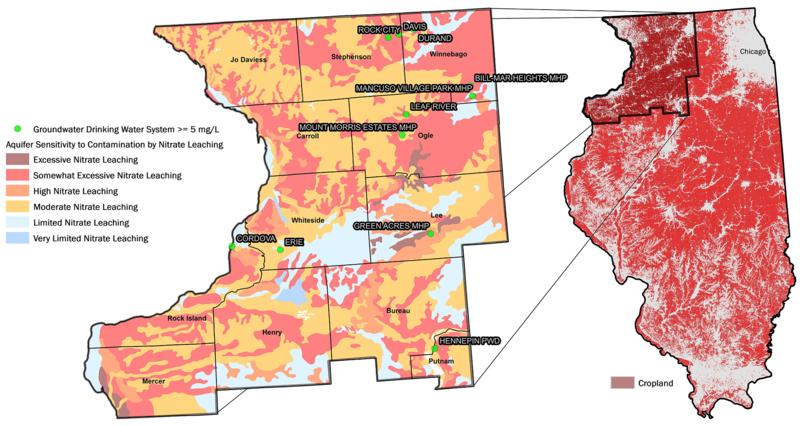 Data from the Illinois Geological Survey show that more than a third of aquifers in northwest Illinois are classified as having “high” to “excessive” susceptibility to nitrates leaching from fields above. But there are practical solutions to keep nitrate out of groundwater in the first place. Cover crops – vegetative cover planted on fields after the cash crop is harvested – soak up nitrates and keep the chemical from seeping into aquifers. But a recent EWG study in Illinois showed that in the fall of 2015 and the spring of 2016, only 2.3 percent of the state’s agricultural areas had cover crops. In the 12 counties of northwest Illinois, less than 0.5 percent of cornfields had cover crops. Federal conservation programs could do much more to protect drinking water. In 2015, only 8 percent of contracts in the Department of Agriculture’s Conservation Stewardship Program and Environmental Quality Incentives Program paid farmers in northwest Illinois to plant cover crops. Only 16 percent paid farmers to improve the way they manage fertilizer and manure to prevent pollution.